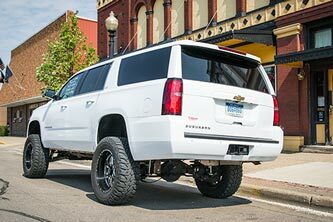 BDS Suspension is now shipping suspension systems for the new 2018 Chevy Tahoe/Suburban and GMC Yukon/YukonXL 1500 4WD SUVs. 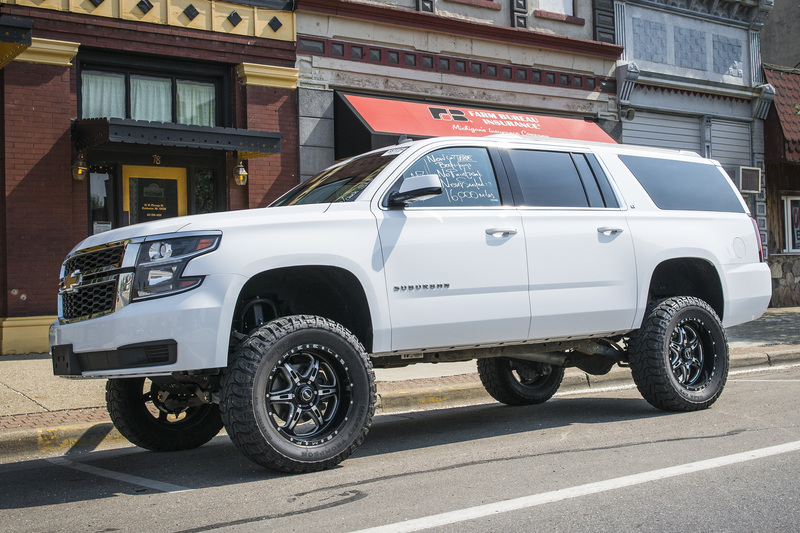 Available in 2", 4" and 6" lift heights, BDS Suspension offers several IFS and coilover suspension lift options to meet your needs and clear up to 35" tires. These kits are a carryover of the 2015-2017 GM1500 SUV applications and have been confirmed compatible with the 2018 models. As with all BDS lift kits, these new options for the 2018 Chevy/GMC SUVs come with Factory Protection Plus, for peace of mind wherever your adventures may take you. Factory Protection Plus includes BDS's exclusive No Fine Print Warranty and is designed to improve the performance, functionality, and curb appeal of the new 2018 Chevy/GMC SUVs without sacrificing the drivability owners have come to expect. 2" Leveling Kit: BDS offers a 2" leveling kit designed to eliminate the factory nose-low rake while improving the vehicles all-around performance and allowing room for larger tires. The kit integrates a new top mounted strut spacer in combination with a pre-load spacer to raise the front end while improving the handling and stability. This 2-piece leveling kit design allows the suspension to fully cycle through wheel travel without maxing out the upper ball joints at full drop as is the case with taller 1-piece strut spacer kits on the market. Optional rear BDS-NX2 series gas or FOX 2.0 gas shocks are also available. This kit allows for up to 33x11.50 tires to be installed. 4" IFS Lift Kits: Stepping up to the 4" IFS lift kits, BDS offers a complete IFS system to correct suspension/steering geometry for improved performance, drivability and offroad capability. 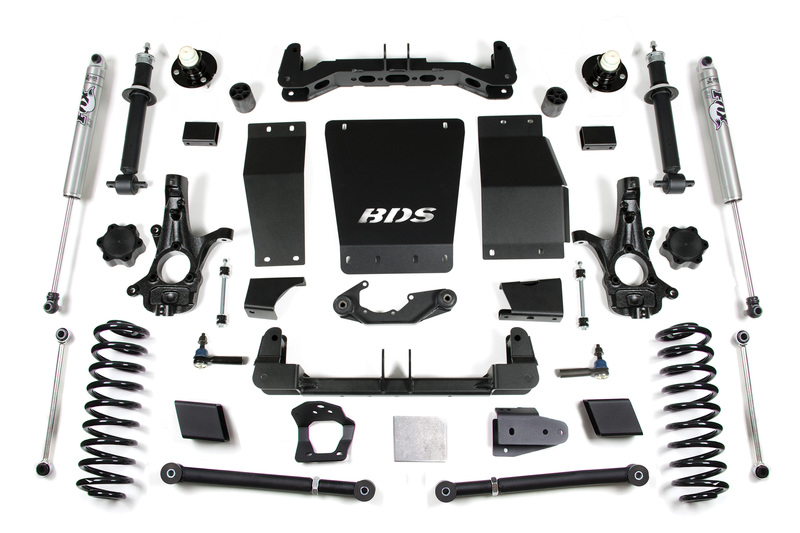 Over the years BDS has built a solid reputation for around top quality, high clearance suspension systems for the newer 1/2-ton GM trucks. These new kits shares the front suspension design with the 1500 trucks and utilize a pair of 1/4" steel high clearance crossmembers and 3-piece skid plate system to reposition the lower arms and add protection of vital drivetrain components. These combined with the CNC machined ductile iron replacement steering knuckles creates a solid subframe to correct suspension and steering geometry for compatibility with the factory installed ESC system. 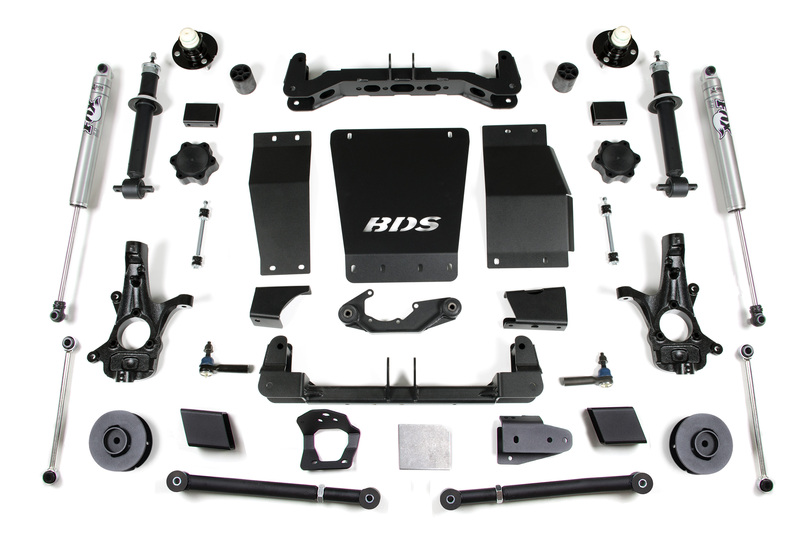 BDS offers these kits compatible with trucks equipped with factory cast steel, factory stamped steel, and factory aluminum control arms so be sure to check before ordering. Up front the kits use a multipoint differential relocation kit and CV spacers to securely reposition the front differential to correct CV axle angle and allow for the use of the stock front driveshaft. In place of the factory struts, high-pressure gas struts are supplied for improved ride quality and off-road dampening. Also included for the front are heavy duty tie rod ends, longer sway bar links, and brake line brackets. 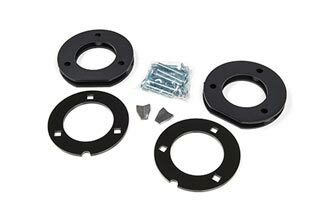 In the rear this 4" lift system a pair of a 2" or 3" coil spacers are available to lift and level the stance. Rear suspension geometry is corrected using a pair of heavy duty adjustable upper control arms along with a track bar relocation bracket and support brace, and longer sway bar links. Also supplied for the rear are bump stop extensions and your choice of BDS- NX2 series gas shocks or FOX 2.0 IFP performance gas shocks. This kit allows for up to 33x12.50 tires to be installed. 6" IFS Lift Kits: The 4" and 6" IFS lift kits share the high clearance design for improved performance over any terrain, improved offroad protection, and enhanced on-road comfort. At the core of these 6" lift systems are a pair of 1/4" steel high clearance crossmembers and full width modular differential skid plate to reposition the lower arms and add protection of vital drivetrain components. These combined with the CNC machined ductile iron replacement steering knuckles creates a solid subframe and correct suspension and steering geometry to be compatible with the factory installed ESC system. Kits are offered for all three factory control arm configurations, cast steel, stamped steel, and aluminum; be sure to check your vehicle before ordering. Differential relocation brackets and CV spacers are used to correct the front axle positioning for stock-like CV axle angles and to retain use of the factory front driveshaft. In place of the stock struts, BDS supplies a pair of high pressure gas struts for improved performance and ride quality. Rounding out the front kit are a pair of replacement tie rod ends, longer sway bar links, brake line brackets, and a front laser cut BDS skid plate. In the rear these of these 6" lift kits BDS offers 5" rear options to level the stance compatible with either the standard SUV or Autoride equipped SUVs. A pair of a 5" ProRide coil springs are supplied to lift and level the stance. These offer improved offroad performance and more travel from the rear suspension. To correct the rear suspension geometry with the taller coils installed a pair of heavy duty adjustable upper control arms are supplied along with a track bar relocation bracket and support brace and longer sway bar links. Also included are a pair of bump stop extensions and your choice of BDS- NX2 series gas shocks or FOX 2.0 IFP performance gas shocks for the non-Autoride equipped SUVs, while the Autoride equipped models use a rear shocks mount extension and sensor bracket. This kit allows for up to 35x12.50 tires to be installed. 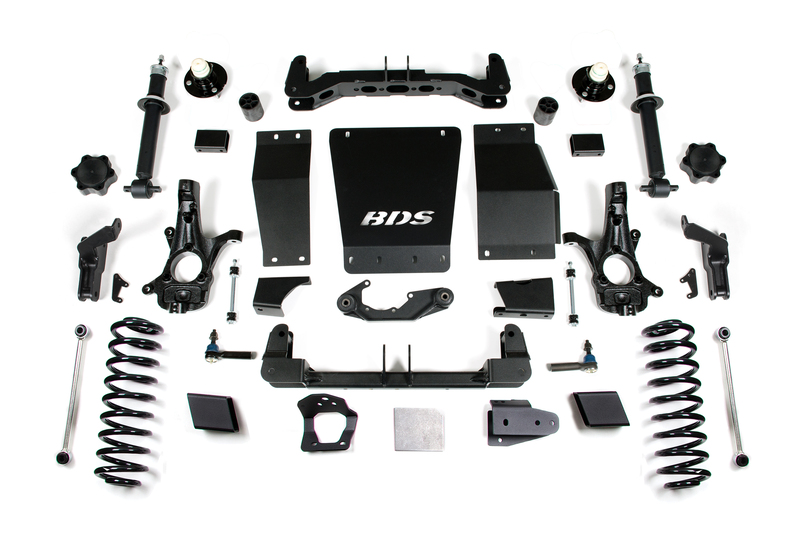 Take your late model GM SUV to the next level with BDS Suspension. 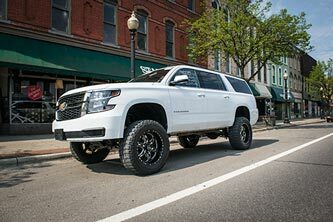 no plans to offer “air ride” conversion kits for the GM1500 SUVs, but we will have additional kit sizes for the auto-ride equipped GM1500 SUV kits coming available in the future. As kits hit the shelf ready for sale we’ll be sending out announcements and adding them to our website. Still waiting for a magnaride compatible kit for 2015 Burb. Fabtec has one now but I really would like a BDS kit. Did I miss it, have you guys released a system yet?